Summer may be coming to an end but casino bonus giveaways never seem to stop at Jackpot Capital Casino. Another massive bonus contest begins today! The casino will give away thousands in random raffle draws in addition to weekly Scoreboard prizes during its $100,000 Back on Track casino bonus event. Jackpot Capital players all over the world earn Scoreboard points just by playing and they win weekly bonuses up to $500, depending on their Scoreboard rank. There will also be five weekly draws for $2,560 each and two for $8,500. All you have to do to qualify is logon and play!. Jackpot Capital Casino brings the thrills of Las Vegas to homes and mobile devices everywhere with casino games like Blackjack and hundreds of slot games including the new Megasaur in the online casino and Texas Tycoon which has just been added to the mobile casino designed for Apple and Android phones and tablets. 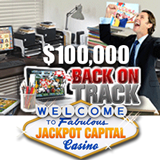 If you're reading this on your phone or tablet tap here http://m.jackpotcapital.eu to go to the mobile casino.